Most Americans have in their homes a book of 66 books bound in one volume, called simply, "The Bible." This book is the religious book of 95% of all the churches in the English-speaking nations such as our own. Is the Bible a closed book to you? Or do you understand portions of it, while the rest remains a mystery? You do want to increase your understanding of the Bible, do you not? In the next few minutes, I am going to give you a key that will unlock the mysteries of the Bible. The Bible story begins in Genesis 1:1.-"In the beginning God created the heaven and the earth." In the rest of chapter 1 we are told of the creation of the animals and "all living creatures on the earth and under the sea." Chapter 2 is of the forming of Adam, placing him in the garden of Eden, of Eve, their disobedience, and removal from the Garden. In a few more pages we read of the flood, the saving of Noah and his household, and the spreading of their descendants across the land. On page 9 of my Bible, we learn of the building of the tower of Babel, its destruction, God's confounding of the people's language, and their dispersion across the earth. In only 9 pages. God covers many centuries, including awesome and terrifying calamities. Then on page 10 God speaks to one man, a man named Abraham, and from this page on, for over a thousand pages, the Bible is about Abraham and his descendants. I will make of thee a great nation, and I will bless thee and make thy name great, and thou shalt be a blessing, And I will bless them that bless thee, and curse them that curseth thee; and in thee shall all families of the earth be blessed. Then follows a number of meetings between God and Abraham. God later meets with Abraham's son, Isaac, and later with Jacob, the son of Isaac, and repeats the promises (or covenants) made with Abraham. 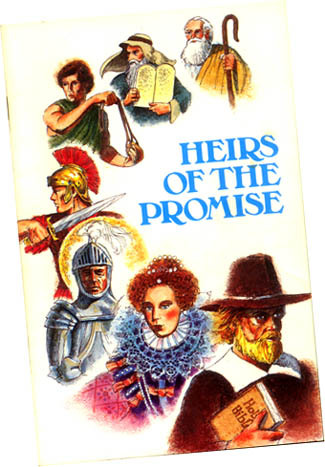 All of these promises and covenants have to do with the future of Jacob's children. The rest of the Bible deals almost exclusively with these heirs of the covenants and the promises, called in the Bible, "The children of Israel." The Law, the doctrines, the warnings, and admonishments, are addressed to Israel. All of the Prophets are Israelites. All of the writers of both the Old Testament and the New Testaments are Israelites. In Amos 3 God said to Israel, "You only have I known of all the families of the earth"
Who are Israelites; to whom pertaineth the adoption, and the glory, and the covenants, and the giving of the law, and the service of God, and the promises. "Blessed be the Lord God of Israel; for he hath visited and redeemed his people! And hath raised up an horn of salvation for us in the house of his servant David;"
The oath which he sware to our father Abraham... (Luke 1:67- 73). Stephen, the first Christian martyr, began his sermon in Acts 7: "The God of glory appeared unto our father, Abraham..."; and then he preached of God and Israel. Paul wrote in Romans 15:4, "whatsoever things were written aforetime were written for our learning..."
And He brought him forth abroad, and said, Look now toward heaven and tell the stars if thou be able to number them; And He said unto him, So shall thy seed be. And he believed in the Lord, and He counted it to him for righteousness. (Genesis. 15:5, 6). This promise of great numbers of descendants is repeated several times. As for Me. behold. My covenant is with thee, and thou shalt be. a father of many nations. Neither shall thy name any more be called Abram, but thy name shall be Abraham: for a father of many nations have I made thee. And I will make thee exceeding fruitful, and I will make nations of thee, and kings shall come out of thee. And I will establish my covenant between Me and thee and thy seed after thee in their generations for an everlasting covenant, to be a God unto thee, and thy seed after thee. (Genesis. 17:3-7). And God said unto Abraham, As for Sarai thy wife, thou shalt not call her name Sarai, but Sarah shall her name be. And I will bless her, and give thee a son also of her; yea, I will bless her, and she shall be a mother of nations; kings of people shall be of her (Genesis. 17:15, 16).